Growing up in Havana has had a profound influence on my outlook both in life and my esthetics. The old buildings with their crumbling facades emit a poetic beauty that I try to transmit through my paintings. I never tire of the ruined old walls full of memories, history, rich colors and textures transposed with TV antenna's, clothes, lines and water tanks. I want my art to be the medium through which I express the love ans joy I have derived from the architecture and music of my city. I hope that in viewing my paintings some of the glory og those enduring legacies will be felt by you as well. Isaac John Lewis was born in Havanna, cuba in 1961 and attended San Alejandro, the oldest established art school in the country, from 1980 to 1985. He behan his artistic career immediately upon receiving his diploma in drawing and painting. One of the earliest project involved working in a children's camp from 1985 to 1993 with "The Young Pioneers" and the child survivors of the Chernobyl nuclear disaster who were sentto Cuba to recover. His work entailed developing visual artistic activities for the children and mural painting for the sites. 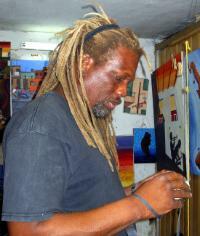 Isaac John Lewis has continuously exhibited his work both in Cuba and worldwide. His work has been published in magazines in Spain (Antillas Barcelona, 2000), the USA (Jazz Times, 1999) and various art catalogues. Mr. Lewis's paintings are in private collections across the globe including Spain, U.S.A, South Africa, Canada, Germany, Holland, the Phillipines, Brazil, Belgium, Portugal, Mexico, japan, Norway, Argentina, France among others. Currently Isaac John Lewis is working on a series of living legend Cuban Jazz musicians for an upcoming exhibit in Vancouver, Canada.